Pin used for remove the offset voltage and balance input voltage. Provided with short circuit and overload protection. Large common mode rejection ratio (CMRR) and differential voltage ranges. No external frequency compensation is required. Prevent from latch-up when common-mode range is exceeded. Minimum, normal and maximum Power Consumption for this IC is ±10v, ±15v and ±22v respectively. Operating temperature should be -50 to 125 ˚C. Supply current – 1.7 to 2.8mA. 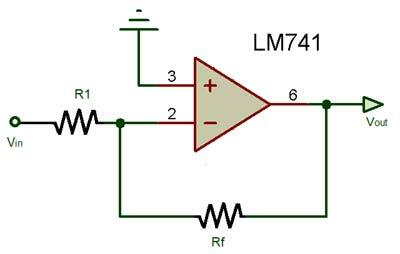 An LM741 operational amplifier is a DC-coupled high gain electronic voltage amplifier. It has only one op-amp inside. An operational amplifier IC is used as a comparator which compares the two signal, the inverting and non-inverting signal. 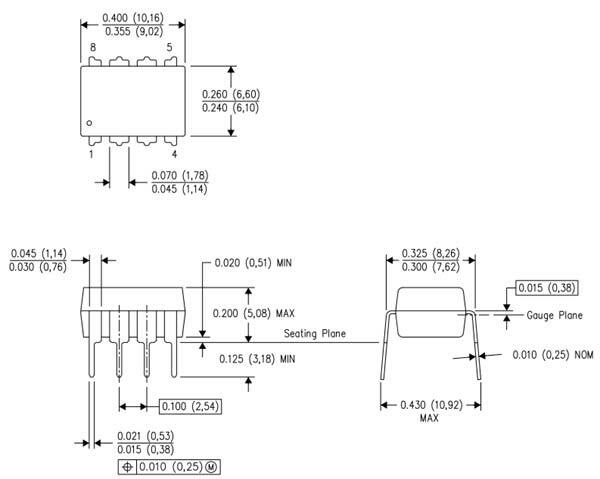 The main function of this IC is to do mathematical operation in various circuits. 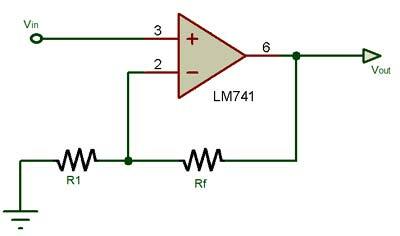 Op-amps have large gain and usually used as Voltage Amplifier. 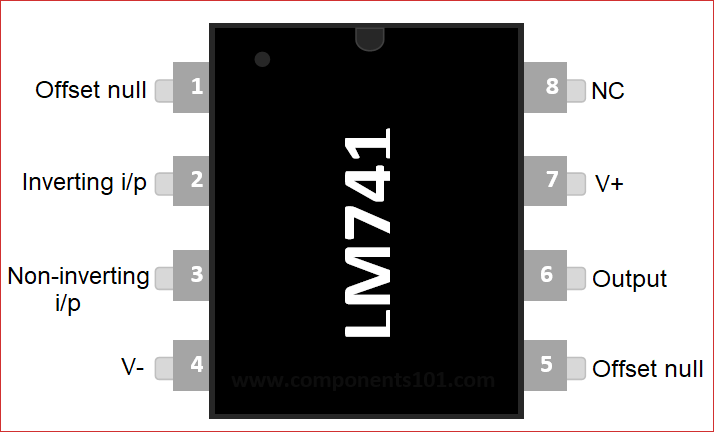 The LM741 can operate with a single or dual power supply voltage. When input source is connected to inverting terminal PIN 2 and feedback with the output PIN 6 then the op-amp is in inverting condition. 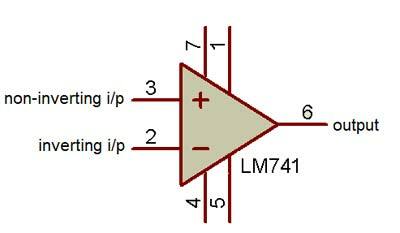 Like if PIN 2 is having +ve polarity then we will get –ve polarity of output from PIN 6. When input source is connected to non-inverting terminal PIN 3 and PIN 2 is feedback with the output PIN 6 then the op-amp is in non-inverting condition. Like if PIN 3 is having +ve polarity then we will get +ve polarity of output from PIN 6. When voltage at non-inverting input (+) is higher than the voltage at inverting input (-), then the output of comparator is HIGH. And if the voltage of inverting input (-) is Higher than non-inverting end (+), then output is LOW. The output of the operational amplifier is the product of the gain and the input voltage. 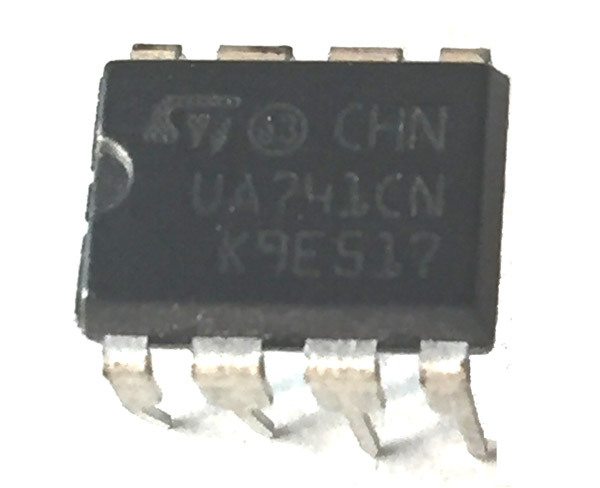 In Op-amp IC 741 PIN2 is an inverting input terminal and PIN3 is non-inverting input terminal. The output pin of this IC is PIN6.